(autoinsidernews) - Mitsubishi Motors announced pricing for upcoming 2007 Outlander crossover SUV and at a glance pricing look to be extremely competitive for the class. The larger, more powerful 2007 Outlander will have a starting retail price of $21,370 for the ES front-wheel drive model, but early buyers will receive a Mitsubishi 25th Anniversary discount of $1,380 for a starting MSRP of $19,990. Pricing will climb to $25,010 for the top-of-the-line XLS with four-wheel drive. This all-new second generation Outlander rides on the same platform as the upcoming Lancer, and is powered by 220-hp MIVEC V6 mated to a six-speed, manually-shiftable automatic. The 2007 Outlander is also offered as a P-ZEV in California where the V6 will be rated at 213-hp. Since it is based on the Lancer platform, the Outlander should have better handling than most crossovers, reports Trend. All Outlander models come standard with the Active Skid and Traction Control system. 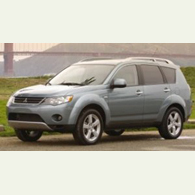 Other standard safety features for all 2007 Outlander models includes six air bags (front, front side, and side curtain air bags for front and second row; anti-lock braking system with electronic brake-force distribution, and a tire pressure monitoring system.